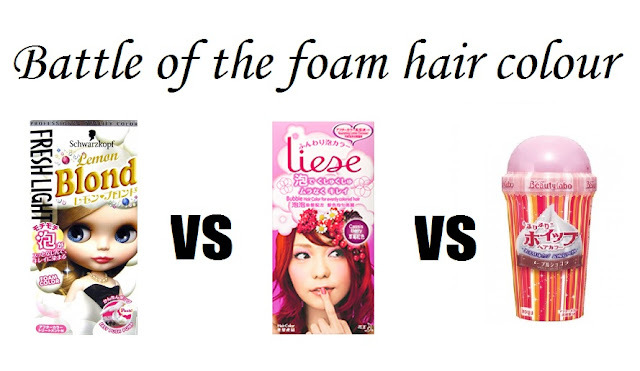 I think I've probably tried all of the foam hair color in the market - Schwarzkopf, Liese and Beautylabo (unless there are new brands that I don't know of). Instead of having to read each review seperately, I'm going to put everything in this post so that it's easier for you to read through. Please remember that everyone's hair condition is different. The table below doesn't reflect the real fact, but only represent my own opinion after experience with those brands. foam. Can be quite tiring. soft and easy to manage. Hair turns rough and coarse. Each brand has its own pros and cons. It depends what you're expecting from the hair dye. If you want a vibrant and long lasting colour, Beautylabo is the best choice. Just remember to apply treatment at the end of the hair, and it's all OK. But if you want a softer and well-managed hair, then go for the Liese colour. You might need to recolour it after 3 weeks. And if you're not too adventurous to try those, go for the Schwarzkopf brand. It is a much safer choice. The price of the three brands are pretty much the same. They're all between RM30-RM40. And they're all available in most major pharmacies. Are you going to dye your hair with foam colour soon? Which is the one you most likely going to try? @theblondpond: I never tried the oil one before. Googling now to educate myself. As long as you put conditioner when washing hair and put hair serum once awhile its ok. I personally like the beautylabo one. The businesses that are displayed on this site are registered companies within dlook's online directory. As a free service, dLook provides this additional portal to help customers connect with local hair colouring services. I never tried beautylabo or liese before but I can pretty much imagine having to scoop the foam out of a tumbler-like "mug" to be pretty messy and frustrating. I tend to disagree w the after effect of liese n beaty labo. Liese for me is dry n coarse while beaty labo is super soft n manageable after dye.